There’s this thing about management consultants: they’re all about trimming inefficiencies wherever and whenever they can. Often, that means eliminating wasteful overhead—in some cases, by firing people—to help businesses save money. So it makes a certain amount of sense that Mitt Romney’s plan for fixing programs for low-income Americans is about sweeping out the federal bureaucratic overlords that administer them. At Sunday’s Meet the Press debate, Romney said that federal administrative costs siphon up the bulk of federal spending on Medicaid, food stamps, and housing vouchers. “You have massive overhead, with government bureaucrats in Washington administering all these programs, [with] very little of the money that’s actually needed by those that really need help, those that can’t care for themselves, actually reaches them,” Romney said. His prescription: hand program funding directly over to the states, which, arguably, would put many of the people who administer the programs in Washington out of work. 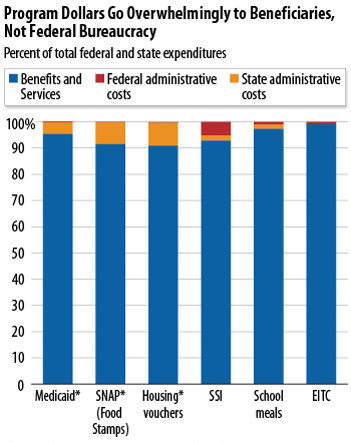 Administrative costs ate up 3.8 percent of federal Medicaid spending in 2010, most of which went toward funding the federal portion of state administrative costs. For the Earned Income Tax Credit, over 99 percent of EITC spending went straight to families receiving it. In short: the premise behind Romney’s plan for saving the social safety net does not hold up. But when it comes to issues affecting the poor, the bar’s already pretty low for Romney. He’s voiced support for Paul Ryan’s safety net-eviscerating budget, and has introduced a very regressive tax plan. Add to that his recent face palm-of-an-interview with Matt Lauer where he dismissed concerns over the wealth gap as rooted in “envy.” But at least he’s not tapping into recent Republican zeal for tagging welfare benefits to costly, punitive, stigmatizing measures like mandatory drug tests and high school diplomas. Mitt Romney is not Gordon Gekko. Or is He?